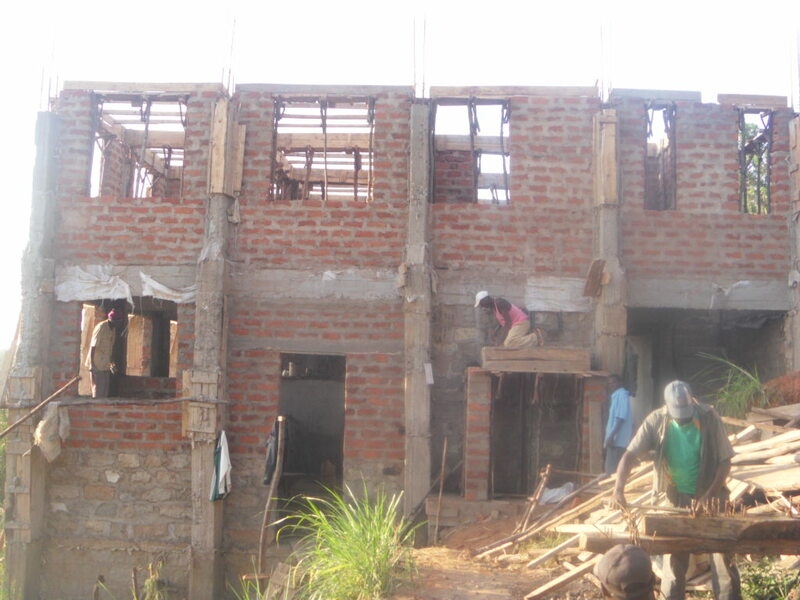 I wanted to make a donation toward the building of the new orphanage. Her incredibly generous donation, along with the money that has already been raised, will go a long way to completing the building. With each monthly update we have tried to include pictures of the ongoing progress and you can see in this month’s pictures that we are making great progress! When I was in Whitehorse, Yukon this past September I was given a donation of $60.00 from Aileen McCorkell. I thanked her and placed the envelope with this money into my computer bag . . . and subsequently ‘lost’ the envelope in my bag until this month. My apologies to Aileen and my thanks to her now again. Your money is finally being put to good use. 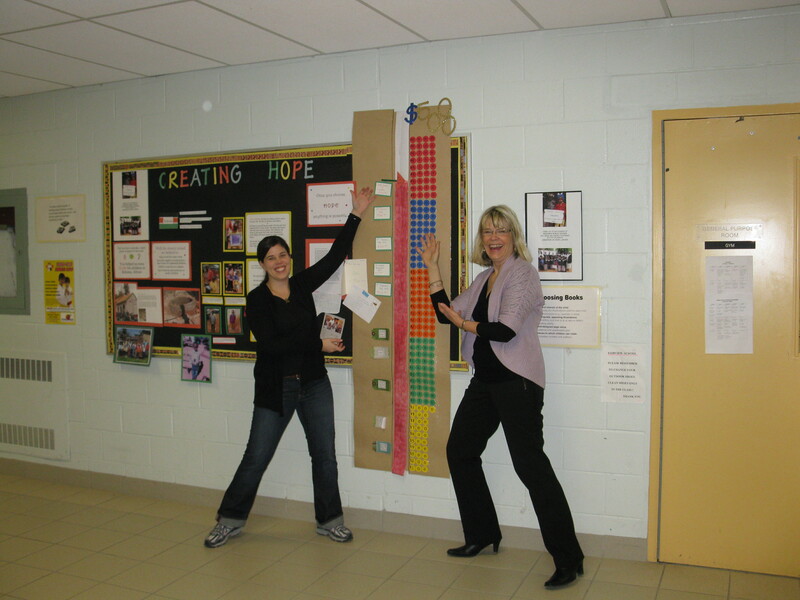 Fairview Public School outdid itself again when they presented Mrs. Walters with a cheque of $1473.00 for Creation of Hope. The school is rapidly heading towards its goal of raising 5000.00 this year. 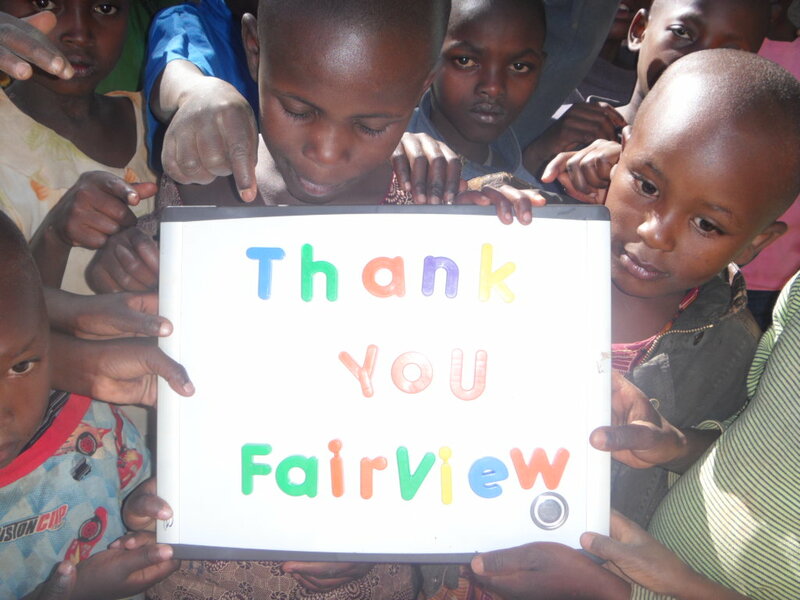 Mrs. Walters came to thank Fairview for its support and, through the use of a slide show, took us through an African Safari and then let us see the incredible changes that have occurred in the village of Kikima. These changes, for some, are the difference between survival and non survival. Through the sale of cupcakes, popcorn and the bracelets (made by Samantha Crawford), Fairview has been a part of fostering a child (come see his picture on our bulletin board) and providing medicine and food for the people in need. Fairview is committing the money to the “greatest need” in the community as determined by the residents in the village who represent Creation of Hope. Some of the money may well go towards the addition to the residence which is slowly but surely being built (as Mrs. Walters said,”Brick by brick”). I had three students in my Civics class (Brooke Wilis, Breanna LaPlante and Wyatt Stinson) who were required to find a cause that they were passionate about. After they found a cause they had to research, make others aware of the issue, volunteer for the organization and/or fundraise for the cause. These three students were taken by the Creation of Hope because it is a local organization where funds go directly to the people they are helping. They were truly passionate about the cause and decided to do a “pie the teacher in the face” event to help raise fund for the Creation of Hope. They managed to make $64.00 on their own . . . well with the help of a few teachers’ faces . . . including mine. I truly wish you the best in helping our Kenyan community with quality-based not survival-based lives. I was in Uganda and Rwanda in 2008 and the people of these nations are so warm and friendly, and yet have experienced what none of us could ever imagine. Once again, I wish you all the best with your endeavours to help these deserving people. We also received this letter from Maple Ridge B.C. My name is Hannah Schenker and I just had a birthday party where instead of presents I asked for donations to help families in Africa. We raised $315. I would like to put the money I received towards buying some families blankets, chickens, solar cookers, farm tools and goats. Basically provide some of what a family or some families need to have a better life. Could you please send a picture of the families we were able to help. I would like to be able to show my friends that helped what their money went to. After your visit to our class in grade seven at Christ the King, I read your book, “Alexandria of Africa” and thought it would be a great book to read to my class. After reading the book to my class the students were very moved by the story you told and how life for children in Kenya was portrayed. Inspired by your book and by the talk you gave to them earlier about your work in Kikima they asked if they could do something to help. I was more than delighted with their compassion and jumped on board to support them. The class spent one of their Information Technology classes researching on line how they could raise funds to support Creation of Hope. They came across the idea of a Vow of Silence marathon and our fundraising plan was born. We had already decided to do a pizza lunch before Christmas, but hadn’t decided on a charity at that time so the class wanted to designate the funds to Creation of Hope. The vow of silence was a resounding success and the students spent the entire day and evening in silence. Activities focused around learning about Africa, Kenya and global issues of poverty and access to education and clean drinking water. The students were very moved by the experience and approached the letter writing and picture making for the children in Kikima with great enthusiasm. We were very delighted with the outcome of both ventures and thrilled to send you in access of $3,100 for both our fundraising projects. The grade seven classes of Christ the King are not done yet with fundraising as another two projects are underway at present and in the near future to offer further assistance to Creation of Hope. You have our deepest appreciation for bringing Creation of Hope into our lives. We are all the better for having you and “Alexandria” touch our lives. These funds from Christ the King Elementary include $15.00 from D.W. Macdonald, plus $150.00 from Alexis and Michael Brandt, $40.00 from Stephen and Tracey Arrell, $50.00 from Marj Hlady. The funds from Christ the King Elementary and those raised by Jack Hulland E.S. in Whitehorse, under the leadership of Sara Tillet, are being combined for a very special project. The main floor of our new building is taking shape. A large part of this floor is the dining room/study hall for the children. 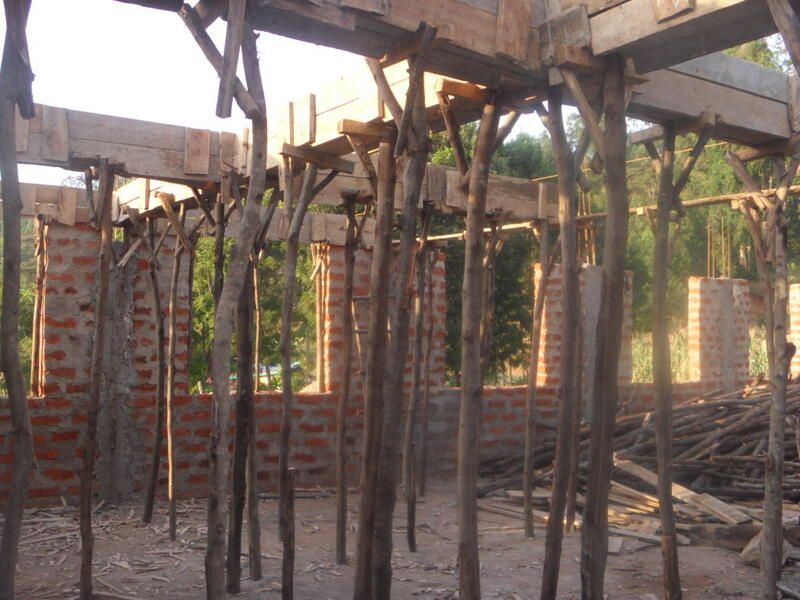 The funds from these two schools are being used to finish this room – put on a roof, finish the walls, windows and doors. This room will be dedicated as The Whitehorse Room. We are going to display a Yukon Flag and pictures of students from the two schools on the walls of the room. In the updates to come you’ll see all of this happen! 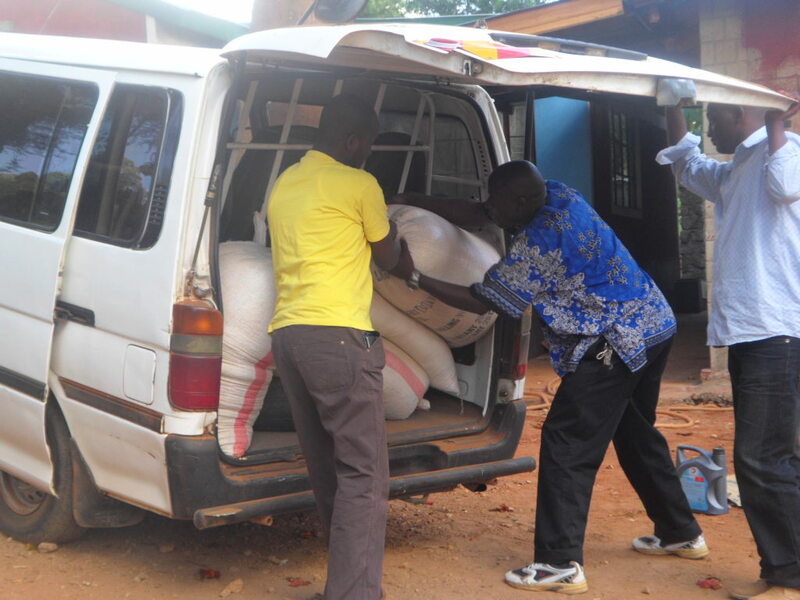 As I write this update our wonderful volunteer, Andy Dila, is finishing up his time in Kikima. During the last two weeks of his stay his mother joined him and stayed at the Rolling Hills Residence. She generously decided that the residence being constructed would need new beds, mattresses, and tables and chairs for the dining room. She has offered to provide the funds for all of this! What an act of true caring. As a final goodbye to the students at the local school where Andy has taught for the past 8 weeks Andy provided funds to feed lunch to all of the students of the school! What a wonderful way to say goodbye . . . at least for now . . . I suspect it’s not if Andy will return to Kikima but when. Children’s writer, Marina Cohen, has taken a special interest in one of the children our project serves, Kitoo Kariuki, and donated $160.00 to pay for this year’s high school tuition for Kitoo. That is a long-lasting gift Marina! Thank you. One of our sponsors, Kelly and Chris Betts, have decided to once again help. Chris gathered funds, $300.00, to purchase a cow for the residents of the home. Our Eco Club has started collecting the foil drink bags (Kool Aid Jammers etc). There is a company that will buy them from the school for 2 cents a piece. 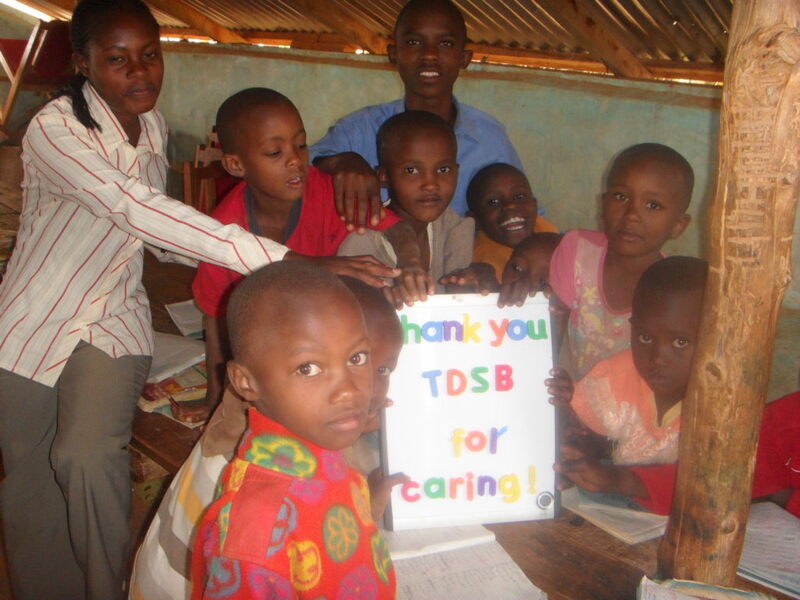 In the spring you will be receiving a small cheque from them to use toward Creation of Hope. Perhaps some of the other schools you deal with could do the same. The grade 7’s have been learning about fair trade goods and are going to sell chocolate bars next week. Whatever profit they manage to make will also be coming your way as will the proceeds from a snack bar at a dance early in March. We now have a school website and I will be putting some information up about Creation of Hope on my Library page. After a riveting talk by Eric to the students of St. Timothy School in 2010 regarding the plight of children in Africa, the students (and the teachers) were so moved, that they felt they had to do something to help. Together they raised an impressive $754.85 to go towards Eric’s cause. Mr.Wilkes raised $198.85 selling discarded books from the school library, Ms. Nunn-Deluca’s class raised $246.00 selling popcorn, and Mr. Masi’s class raised $310.00 selling freezies. 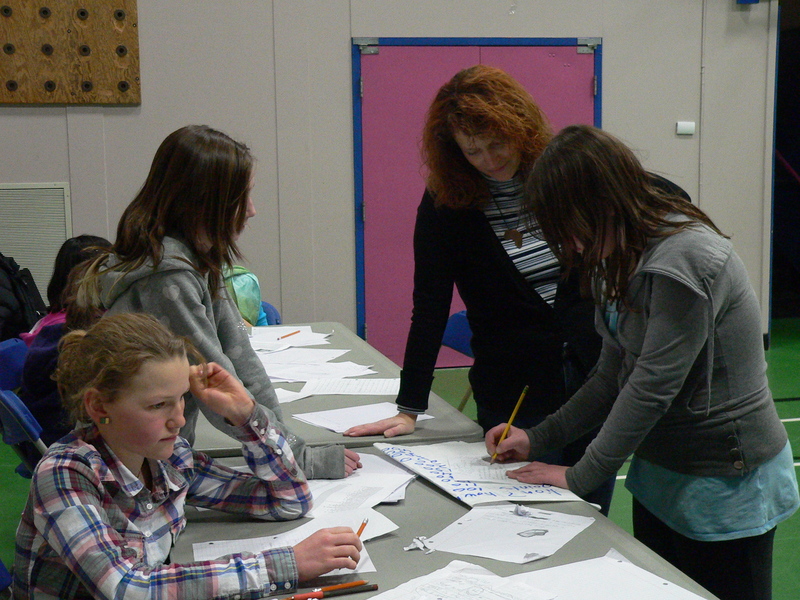 On February 16th and 17th two Literacy Days were held. Over a thousand children of the Toronto District School Board were entertained by presentations from Jo Ellen Bogart, Sharon Jennings, Loris Lesynski, Glenn Marais, Ruth Ohi, Barbara Reid, Ted Staunton and Jeremy Tankard. All of these incredible people donated their time and all proceeds from the event are directed to The Creation of Hope. 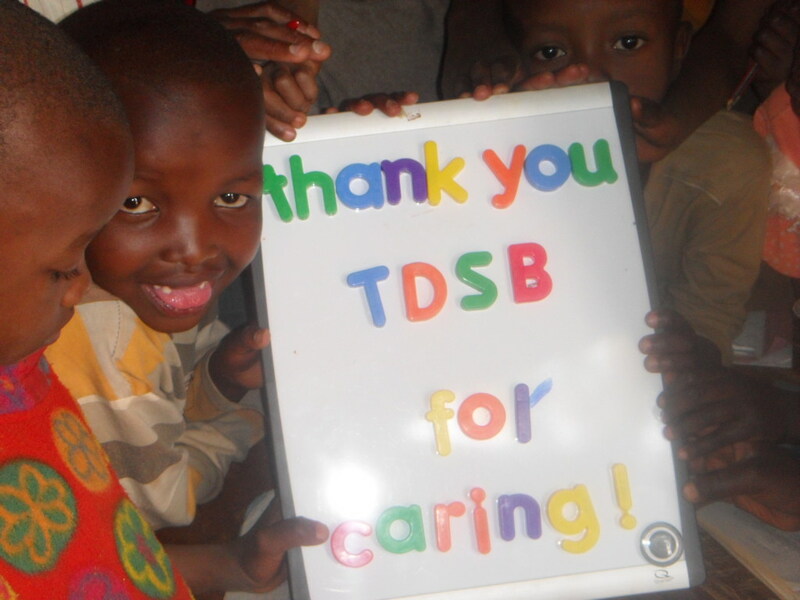 Below are the thanks of our residents to the TDSB for providing the setting and the funds which will change lives in Kenya. Here’s a letter from Ruth about the update. It has been a while since I wrote about the construction. We have made many steps and the inside of the basement rooms have been plastered and made ready for plastering. There are toilet and bathrooms in the basement that we are making ready for the boys. The top floor is now being prepared for the roof as you can see in the attached photos. The windows and doors will be fitted in soon. This work is moving forward very fast. You will be amazed when you visit later in the summer. We have an ongoing relationship with Exodus Children’s Home run by our good friend, Elijah. 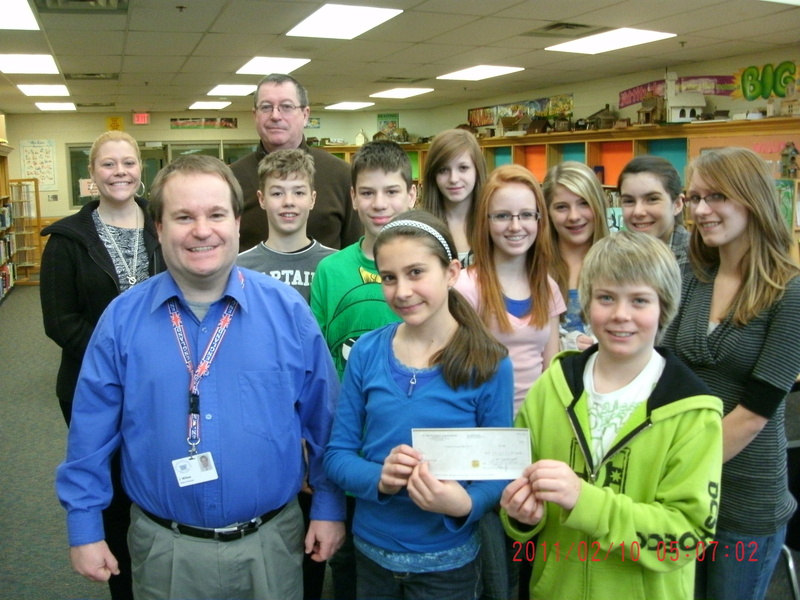 Through the efforts of LaSalle Public School their rent has been paid for the past two years. 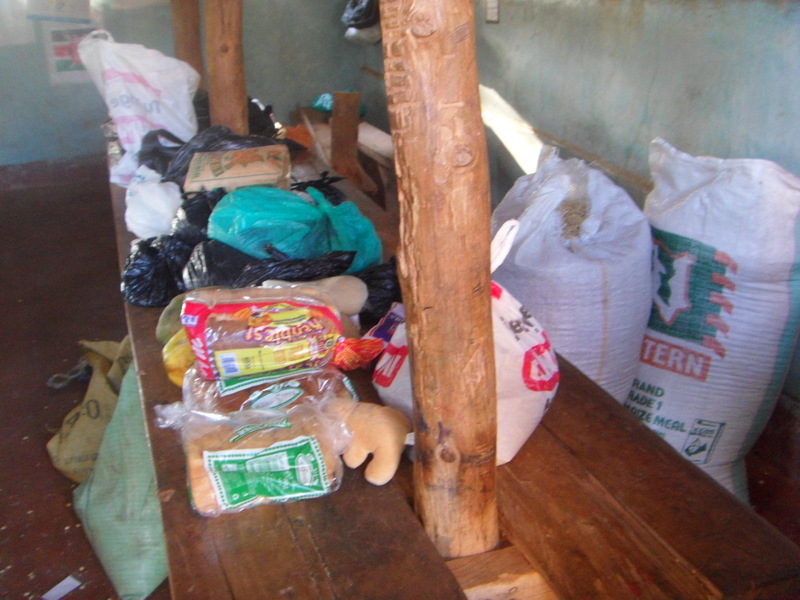 In addition through the sponsorship of four children in their home we provide ongoing support for education for children and funds to help provide food for all the children in the home. We wanted to make sure that all of the children would have a wonderful Christmas so Anita and I provided funds for presents and a celebration for all of the children in Exodus. Below are the students whose high school educations were funded for this school year – January through December of 2011. High school costs include tuition fees and residence but not clothing, equipment, texts and tests. 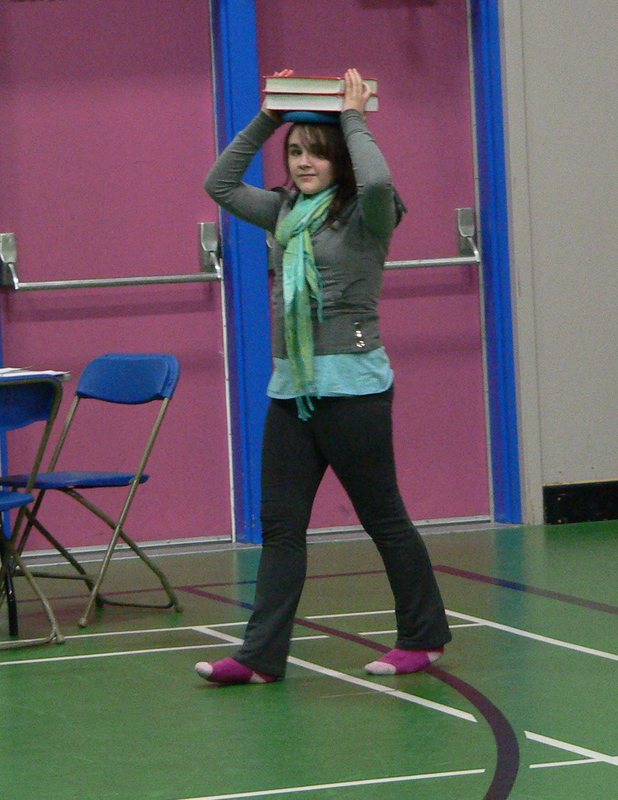 Their grade 8 exams helped to determine the ‘level’ of school which they could attend. In one case, with Mirriam her exam results indicated that it would be in her best interests, especially in light of her age, to go directly to a polytech where she can be taught a specific skill and become fully independent and self-sufficient. $400.00 from St. Timothy was used to purchase cement for the addition and $260.85 was directed to paying for plumbing supplies. The remaining money provided was used to pay for the January salary of the Matron. $800.00 from Fairview was used to purchase cement for the addition. In addition $109.00 of the funds from Fairview was used for the February salary of the Matron and $66.00 for the February tutoring costs. 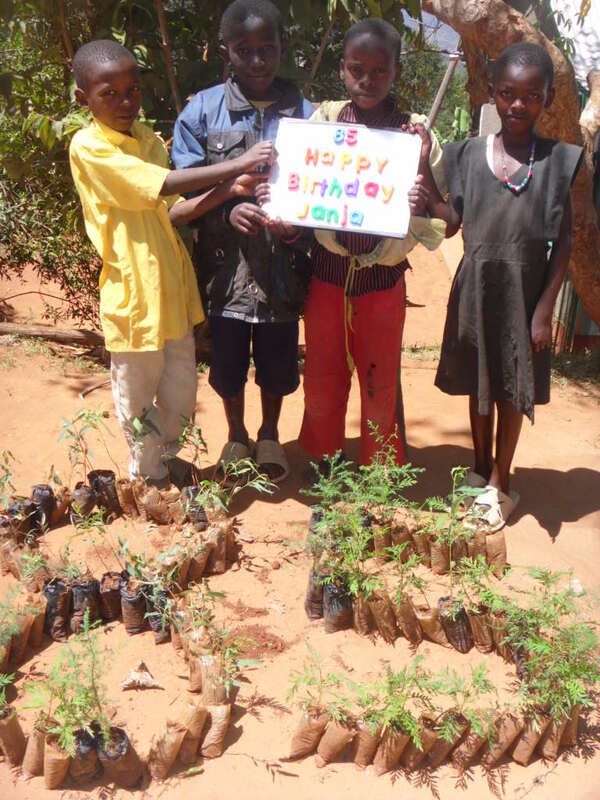 And finally, a special 85th birthday message from Sharon Freeman, for Janja – the planting of 85 saplings! With thanks to all the students, schools, donors and friends who continue to support Creation of Hope in so many generous and significant ways! 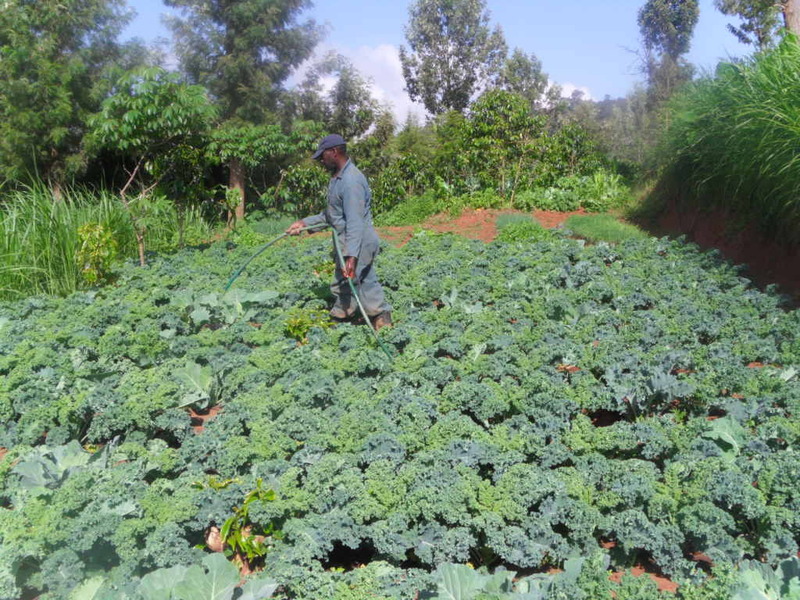 Due to the current drought that has hit Kenya, we have resorted to irrigating the farm land so that we don’t lose the crops. Kioko, Ruth’s and Henry’s son, brought a group of visitors from an Airport Security firm called AGSC, Jomo Kenyatta International Airport branch, to pay the children a visit. They came carrying food stuff worth Ksh. 16,000 which they presented to the kids. And, they also promised to be coming FOUR times a YEAR! We have had two groups of women visit the orphanage. 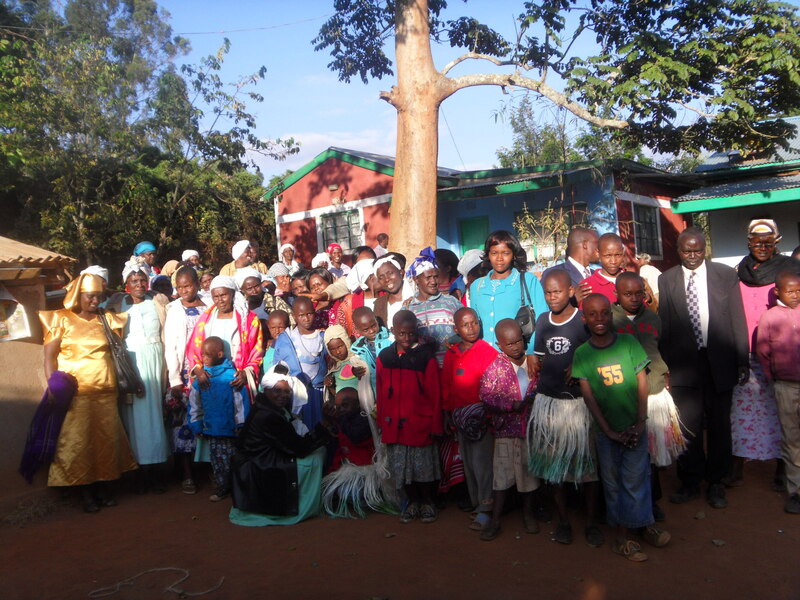 The first group was made up of women from 14 inter-denominational churches in lower Mbooni, a place called Mulaani. 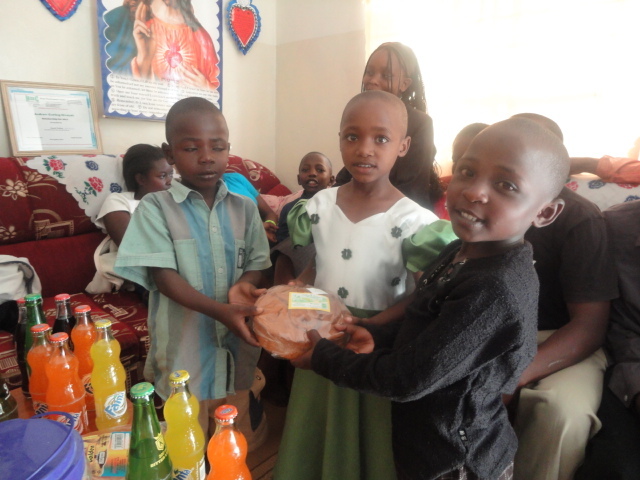 They came bearing gifts for the children and also promised to come back again in the future. The next lot of visitors was from one church and they were made up of two groups. One was the women’s guild and the other the widow’s group. 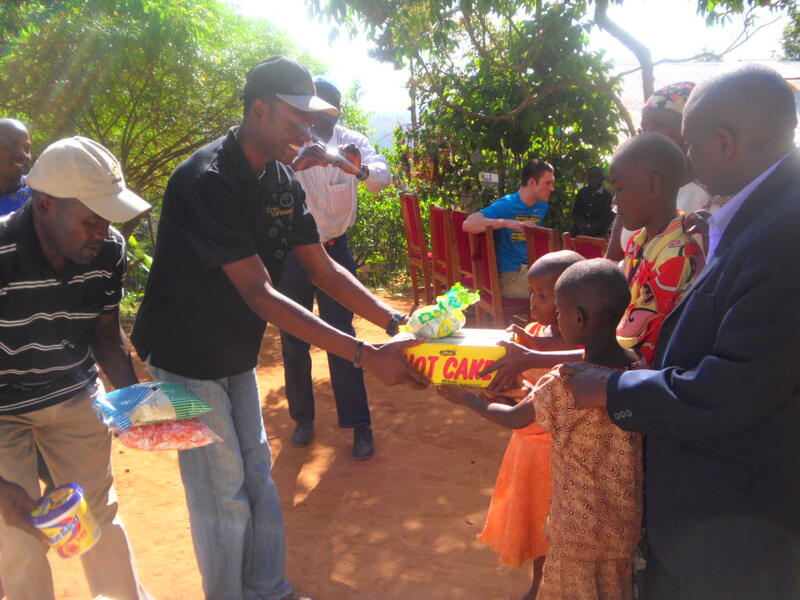 They also bore gifts for the children and promised to visit many more times. The widows wear blue outfits and the guild wear pink. The women offer their gifts to the children. They were accompanied by their Pastors.